We just dug out all the board books we used to read to Juniper and so far this one is Gram's favorite. He's not saying much yet but he loves to make monkey sounds, so this one's always good for some screeching. When Doug French gave us this book during lunch in New York a few years ago, he briefly mentioned that he found the second-to-last page disturbing. Now that I've read this book a few hundred times, I have to agree that this might be the single most frightening image in the history of children's literature, and I'd swear to that on a stack of Grimm's Fairy Tales. Millions of fingers! Millions of thumbs! 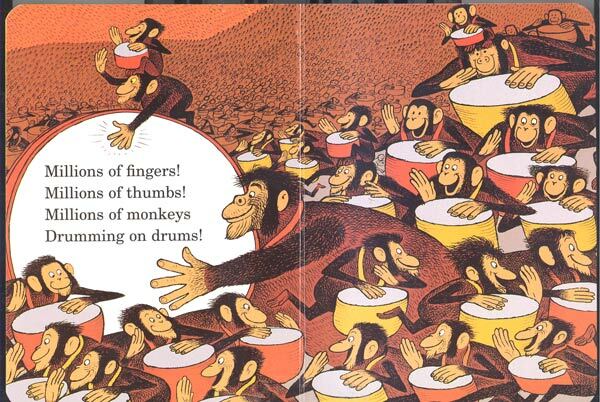 Millions of monkeys drumming on drums! On one hand, they have drums, so at least they aren't masturbating or flinging poo. But try for a second to imagine the sound of a MILLION MONKEYS DRUMMING ON DRUMS coming towards you. That's what I heard in my nightmares last night.